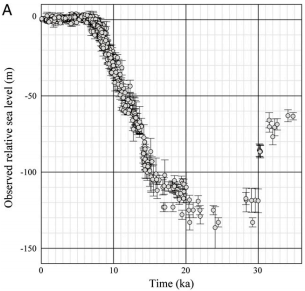 A new paper published in PNAS finds global sea levels rose up to 8 times faster than the present after the peak of the last ice age ~20,000 years ago, followed by a large deceleration starting ~6,000 years ago to stable levels until "the renewed sea-level rise [beginning] at 100–150 years ago." Examination of the data from the paper, however, shows the range of proxy sea levels is approximately 10 meters, far too large to discern the tiny ~1.5 mm/yr sea level rise over the past 150 years. The authors instead assume from other published studies of tide gauge measurements that the ~1.5 mm/yr sea level rise over the past 150+ years began at that point in time. Other papers find sea levels rising only 1.1-1.3 mm/yr over the past 203 years, and without acceleration. Regardless, even the IPCC concedes that there was no significant anthropogenic influence on climate prior to 1950, thus man is not be responsible for sea level rise beginning 150-200 years ago, at the end of the Little Ice Age. The sea level rise over the past ~200 years shows no evidence of acceleration, which is necessary to assume a man-made influence. Sea level rise instead decelerated over the 20th century, decelerated 31% since 2002 and decelerated 44% since 2004 to less than 7 inches per century. There is no evidence of an acceleration of sea level rise, and therefore no evidence of any man-made effect on sea levels. Sea level rise is primarily a local phenomenon related to land subsidence, not CO2 levels. Therefore, areas with groundwater depletion and land subsidence have much higher rates of relative sea level rise, but this has absolutely nothing to do with man-made CO2. As this post was being written, WUWT posted on this same journal article, which makes additional recommended points regarding much higher sea levels during prior interglacials, etc. Fig. 1. Global sea levels over the past 35,000 years. Horizontal axis is thousands of years before the present [i.e. present at the left side of graph]. Range of proxy studies of sea levels is approximately 10 meters over the past ~15,000 years. Several areas of earth science require knowledge of the fluctuations in sea level and ice volume through glacial cycles. These include understanding past ice sheets and providing boundary conditions for paleoclimate models, calibrating marine-sediment isotopic records, and providing thebackground signal for evaluating anthropogenic contributions to sea level. From ∼1,000 observations of sea level, allowing for isostatic and tectonic contributions, we have quantified therise and fall in global ocean and ice volumes for the past 35,000 years. Of particular note is that during the ∼6,000 y up to the start of the recent rise ∼100−150 y ago, there is no evidence forglobal oscillations in sea level on time scales exceeding ∼200 y duration or 15−20 cm amplitude. The major cause of sea-level change during ice ages is the exchange of water between ice and ocean and the planet’s dynamic response to the changing surface load. Inversion of ∼1,000 observations for thepast 35,000 y from localities far from former ice margins has provided new constraints on the fluctuation of ice volume in this interval. Key results are: (i) a rapid final fall in global sea level of ∼40 m in < 2,000 y at the onset of the glacial maximum ∼30,000 y before present (30 ka BP); (ii) a slow fall to −134 m from 29 to 21 ka BP with a maximum grounded ice volume of ∼52 × 106 km3 greater than today; (iii) after an initial short duration rapid rise and a short interval of near-constant sea level, the main phase of deglaciation occurred from ∼16.5 ka BP to ∼8.2 ka BP at an average rate of rise of 12 m⋅ka−1 punctuated by periods of greater, particularly at 14.5–14.0 ka BP at ≥40 mm⋅y−1 (MWP-1A), and lesser, from 12.5 to 11.5 ka BP (Younger Dryas), rates; (iv) no evidence for a global MWP-1B event at ∼11.3 ka BP; and (v) a progressive decrease in the rate of rise from 8.2 ka to ∼2.5 ka BP, after which ocean volumes remained nearly constant until the renewed sea-level rise at 100–150 y ago, with no evidence of oscillations exceeding ∼15–20 cm in time intervals ≥ 200 y from 6 to 0.15 ka BP. So, it's not "worse than they thought" ..... how does this stuff get thru peer review?